Giuseppe Pieroni, who built the current villa in 1911, was one of four brothers who lived and travelled between Boston and Barga in the late nineteenth and early twentieth century. An early proof of the family’s entrepreneurial spirit came when their ancestor Paolo Pieroni joined the Australian Gold Rush in the early 1800s, returning with a bag of the precious metal. In 1855, a 25 year old Enrico Pieroni embarked for Boston with a small cargo of white plaster figurines of historic and religious subjects to trade. These figurines were sold throughout Scotland (which has deep ties to Barga), England and Scandinavia too. Returning successfully to Barga, he fathered four boys. One of them, Giuseppe, was to become the driving force in a significant restaurant empire that would last for eighty years. Realising that there was no future in plaster figurines, Enrico nevertheless encouraged his boys to go to America and seek out their fortune. Specifically he exhorted his son Giuseppe to learn how to cook and to speak English. Thus it was that 15 year old Giuseppe left Italy in 1890. Desperately short of money, he lodged in a boarding house in Charlestown and soon found himself washing dishes in the basement of a 10 storey restaurant in Washington Street. Within two years he became 3rd Chef de Grille, being promoted again the following year. He swiftly became Premier Grilleur in a Freemont Street Restaurant as an 18 year old in 1893 – while using every spare Sunday, with his brothers, to sample and compare competing restaurants’ dishes. 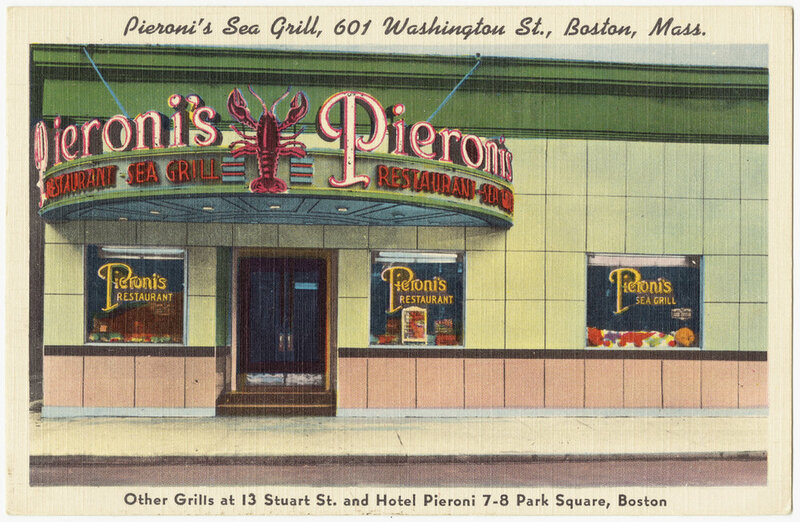 The brothers opened their own restaurant in Beacon Street a year later, in 1894, under the new name Pieroni’s Sea Grill - and customers soon found the fare with its secret seafood sauce to their liking. The business went from strength to strength. 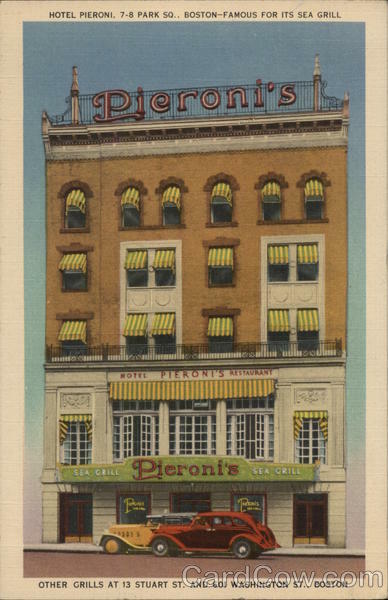 From Beacon Street the business moved to a 700 seat restaurant in Eliot Street in the commercial district and then added a 1200 seater restaurant in Washington Street, followed by 600 seater in Tremont Street in the theatre district and, finally, in 1919, the Pieroni Hotel on Park Square. The hotel went on to win a gold medal in Nice in 1930. By this time Giuseppe had already long planned and built his magnificent villa, designed, so it is said, by Italian architects in Boston and finished in 1911. In 1925 Giuseppe reached a further pinnacle in his career, being elected president of the Boston Chamber of Commerce. Having amassed a fortune and given opportunities to more than a thousand people from the Serchio Valley he died unexpectedly on 25th Feb 1944 at 69 in one of the restaurants, having been unable to return to his native Italy because of the war. Although he was never to enjoy retirement at the villa his wife Meri did survive him there for many years, but not before the house had become first a billet for German, and then US soldiers, as they battled on Kesselring’s Gothic Line. The scale of the Pieroni brothers’ contribution was finally recognised by the province of Tuscany with a gold medal in 1992. Only three other owners have lived at the house since the time of the last Pieroni occupant. After a short period of decline in the 1980s the house began to blossom once again in the 1990s. In the last few years Villa Pieroni has been reborn, repainted in its original ochre yellow colours and playing host to visitors ranging from the movie actor Woody Harrelson to singing legend Willy Nelson and the distinguished architect and Italian Senator Paolo Riani (himself a descendant of the Pieroni family) as well as a host of business leaders and entrepreneurs.